Throb App Trick :- Hello visitor hope you all are good and enjoying our tricks and saving deals. tricknsave blog is back to share a wonderful app through which you can win Rs 150 Amazon gift voucher for just referring the friend on this app. 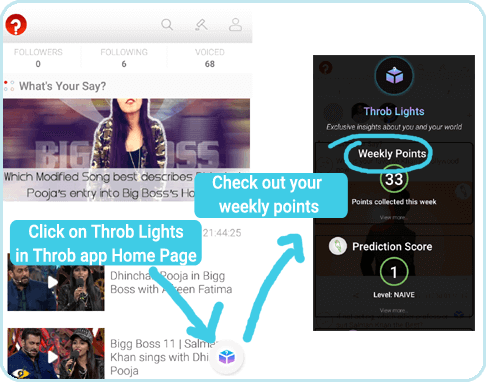 This is all about throb app.A�yes guys throb app is a newly launched app and giving amazon gift voucher for referring 3 friend on throb app. Just Read The Full Post To Get All Deatails About Throb App Trick. 2.> Open The app And Scroll The Welcome Screen. 3.> Now Click On > New To Throb. 4.> Now Fill Details Like Email Address , Name , Mobile NO. And Password. 5. > Now Click On >>> Reffral CodeA�And Put 8826387282 In Referral Code. 7.> Throb App Will Automatically Verify Your Mobile No. Through Otp. 8.> Done !!! Now Just Tell Your Friend To Download The Throb App And Put Your Mobile No. On Friends Referral Code Section. How will I get my Voucher? Once you bag 50 or more points, it will show a a�?Congratsa�? message in the points section in Throb Lights. The voucher will be then automatically sent to you within 2-3 working days AFTER THE OFFER WEEK ENDS.Eg: Current week is 1 Jan a�� 7 Jan and you score 50 points within 1st-7th Jan, then the voucher will automatically be emailed to you before 10th Jan. In this app Your registered Mobile number is your refer code. a�� Every week the points will be reset for every user. The week begins at Sunday 12:00 at Night. a�� Only valid users are eligible to participate in the contest. Fake accounts as identified by Throb will be suspended. Please refer to theA�Basic RulesA�for more details. a�� One person can win only one reward in a week even if one scores more than 50 points, but can win multiple rewards across different weeks. a�� The offer can be withdrawn or rules can be changed any time without prior notice. a�� The offer is valid till stocks last. a�� In case of any dispute, the decision taken by Throb will be binding and final.